to Track and Trace Throughout the Supply Chain. Track Inventory from Purchase Through Production. 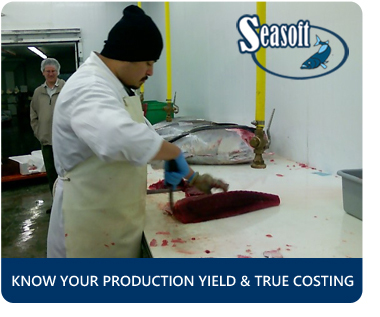 Production efficiency and complete seafood traceability are at the heart of the Seasoft ERP Software. You can easily track and account for inventory from the point of purchase through the entire production process. This full traceability—and the corresponding 100% accuracy in costing of finished goods—helps you identify the real-time margin of every product, so you can sell more profitably while affording your customers the security of traceability. Seasoft automatically tracks lots each time inventory is moved or transferred and records it electronically as it happens. From a food traceability perspective, lot history is maintained from the time it is received through all production steps and is completed when product is shipped. Strategically located computer terminals or hand-held barcode scanner devices throughout your facility monitor every product, product movement and product transformation and capture essential information from bins, containers and packages. Data is then recorded in real-time to a secure, central file where it can be retrieved as needed. 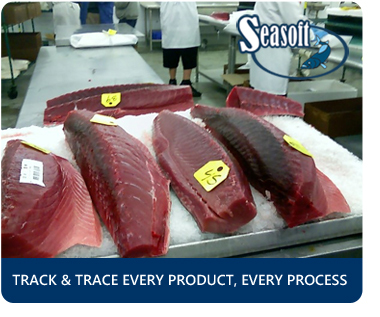 When product is being reworked or if there are partial returns to storage, for example, Seasoft maintains detailed, serialized tracking of products without a loss of individual animal traceability. In a processing environment, each step is identified to ensure the outputs become the inputs of subsequent processes, enabling you to easily trace product back to its source materials. Seasoft also offers compliance with the Seafood Import Monitoring Program (SIMP), the latest effort by the National Oceanographic and Atmospheric Administration (NOAA) to prevent illegal, unreported and unregulated seafood from entering the U.S.
Seasoft’s automated data capture of incoming and outgoing products for each process simplifies the yield (or shrinkage) calculation. By registering the weights of each bin going into a batch or process, and recording the actual weights of outgoing containers, Seasoft pinpoints the exact yield of that process over a particular period. Assign barcodes to containers of finished goods as well as raw materials used in producing a batch of finished product. For all shipped outgoing products, Seasoft identifies the sources of the materials back to the received incoming products, saving considerable time and money in the event of a food safety recall. Barcodes imprinted on the label can include not only the lot tracking information to facilitate food traceability, but method of production (M.O.P.) and production location, pack weight and date, inspection, and other identifying information. With Seasoft, all instances of each material are always known, enabling detailed and accurate inventory of raw materials, in-process materials, finished goods and packaging materials on hand. Seasoft also offers a great tool for extending visibility of materials by criteria such as warehouse or freezer location, age, type, and supplier. With the right capabilities, inventory and warehouse management functions can greatly enhance productivity and effectiveness, including better stock rotation and reduced inventory levels (e.g. less “safety stock” required).